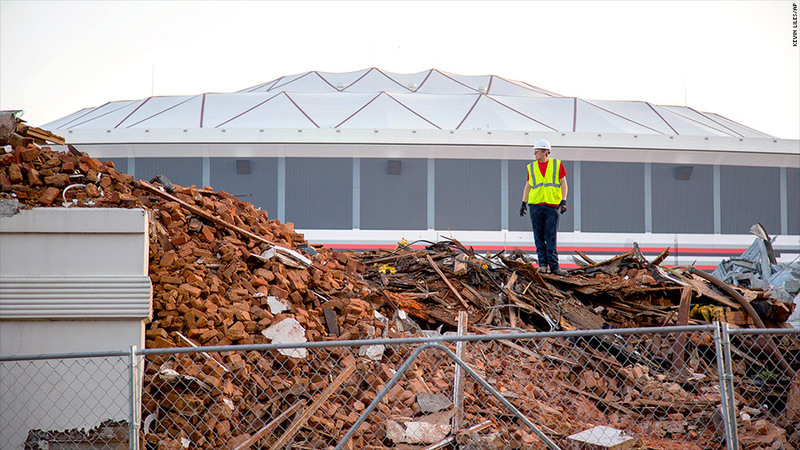 A construction worker stands atop debris of a church torn down to make way for a new stadium to replace the 22-year old Georgia Dome in the background. The Georgia Dome, home of the NFL's Atlanta Falcons, is only 22 years old -- younger than most of the Falcon players. But its days are already numbered. Fans attending games this season will be able to see the team's next home under construction next door. It is due to open in three years. The NFL is in the midst of a building boom, with ten new stadiums in the last 12 years, and two more under construction. The median age of the stadiums replaced was only 31 years. It used to be stadiums would be nearly 50 years old before the wrecking ball swung. The reason is simple: New stadiums maximize revenue in a way old stadiums never did. NFL teams share most of their revenue, including most ticket sales and all broadcast rights. But most of the other money they make in the stadium -- from luxury boxes, advertising and concessions -- they can keep themselves. "What they're doing is maximizing every inch of real estate for the maximum money," said Corey Suppes, co-founder of the website Ballparks.com, which tracks professional sports stadiums and arenas in North America. "Every nook and cranny has something in it." In order to lure fans who might prefer the comfort of watching games on big-screen TVs at home, teams are improving the in-stadium experience: Wider concourses, high-end restaurants, WiFi networks and huge television screens that can be up to 60 yards long. "If you want to keep up with the Jerry Joneses, a 20-year-old stadium isn't going to cut it," said Marc Ganis, a sports industry consultant who has worked on numerous stadium deals, referring to the Dallas Cowboys owner who opened a billion dollar stadium in 2009. While teams and the league pay for some of the building boom, taxpayers and fans foot a lot of the bill. Teams are able to negotiate with local governments to get hundreds of millions of tax dollars for new stadiums. 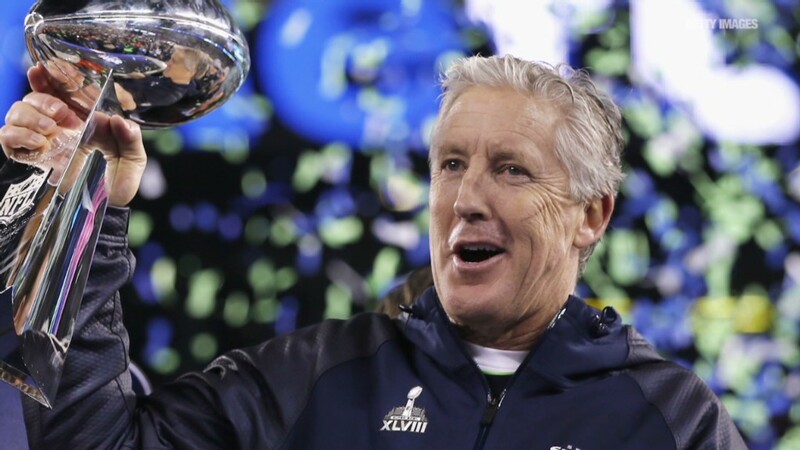 If a city balks, the team can threaten to move to an area that's more willing to pay. The 49ers tried to get San Francisco to help build a new stadium. When the city balked, they moved 40 miles south to a new stadium that opened this season in Santa Clara, Calif.
As for fans, they get hit not only with higher prices for individual game tickets, but also with personal seat licenses, which are fees that run thousands of dollars per seat that give them nothing but the right to buy season tickets. Average ticket prices at the 49ers' new Levi's Stadium are $117 each, according to Team Marketing Report, which tracks prices and fan costs. That's the second highest in the league and about 40% more than the price at their former home last season. And there are signs the trend is accelerating. Washington Redskins owner Daniel Snyder recently said his team is already starting to look for a replacement for FedEx Field. It opened in 1997. "We love FedEx Field, it's a great place to feature our home games, but it's 17 years old now. So I think it's time for us to start looking," he said in a television interview.